Wednesday morning was the annual Women’s Breakfast, supporting the JF&CS Center for Early Relationship Support® (CERS) and celebrating the 25th anniversary of the Lauren and Mark Rubin Visiting Moms® program. 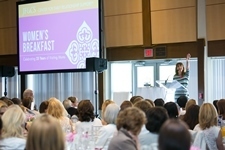 It was our most successful Women’s Breakfast ever, with more than 350 people in attendance and raising more than $260,000. We are enormously grateful. This year, we were joined at the Breakfast by filmmaker Josh Seftel and his mother, Pat, who shared their reflections about the importance – and joy – of staying connected via their sweet, entertaining FaceTime chats.